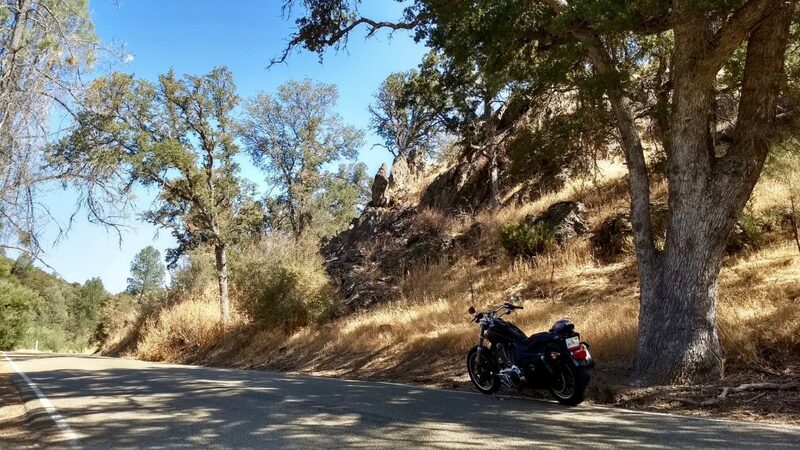 Over the last year, I’ve made a number of trips to the San Francisco Bay Area, hiring a number of bikes out there and explored many great roads and locations. Here I have rounded up some of the best routes I enjoyed ready for you to download and check out if you’re in the area. Starting just South of San Fran on the coast at Half Moon Bay, this route cuts inland and climbs up to Skyline Boulevard Route 35, where it weaves South along a stunning forest ridge line overlooking San Jose. 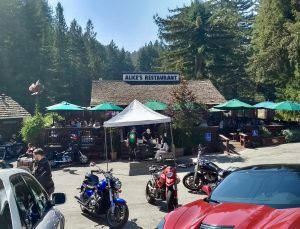 First pitstop is Alice’s Restaurant, located where many great biking roads meet, it’s a mecca for bikers and also serves up some yummy food. From Alice’s we continue South on Route 35, before turning off onto Route 9 and then 236 to head around the Big Basin Redwoods State Park loop. 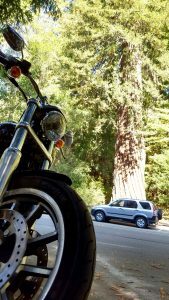 This park has some epic redwoods that are just huge. Speed limits are slow on this loop, but the road is narrow and very twisty as it cuts between the trees and hillside, but it’s ice rink smooth with perfect camber on every bend. Take a pitstop at the Park visitor centre for refreshment and go check out the ‘Mother and Father’ of the forest, two of the hugest trees you’re likely to see. Next continue South, rejoin Route 9 and make your way down to Santa Cruz through Boulder Creek. Check out the sea front attractions at Santa Cruz Beach Broadwalk or take a cruise along the picturesque West Cliff to soak up the Pacific views. A similar route to above, this time starting in Palo Alto on the North side of San Jose, where we head up Page Mill Road, a winding hill and narrow climb that takes you out of the suburbs up into the surrounding mountains and on the Skyline Boulevard Route 35. A great road, but popular cycle route, so take care. Next we follow Route 35 South, crossing Route 9 until it stops at Route 17. A great road that weaves through the forest hill sides, but be warned it does rather abruptly drop down to a narrow single track at the junction with Black Road. The first half is great for fast bends to swoop around, the latter half is a bit bumpier and more technical with some tight bends. The remainder of the route continues on the other side of Route 17 freeway, running South almost in parallel on a more interesting and bendy tree lined route. A little slower on speed limits, but definitely more picturesque. Do stop in at Casalegno’s Store for a top notch coffee before you hit the bustle of Santa Cruz. I finished up at Capitola Beach, a good spot to grab some ice cream and ponder the grandness of the Pacific Ocean. This is a particular favourite route of mine, which takes in the epic climb up Mount Hamilton and across some of the deserted back roads which feel like you’re in the middle of nowhere. The route starts on the outskirts of San Jose taking Route 130 up into the overlooking hillside. The road rapidly climbs and gets very twisty with many tight and steep hairpins. With few barriers about, you definitely don’t want to over cook it on one of these bends. 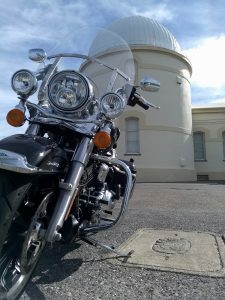 At the peak, stop in at the Lick Observatory where the views are stunning and there’s a handy WC available even when the observatory is not open to public yet. Many bikers stop here and it’s a great place to chat with others. Continuing down the the other side of the hills, although the road widens out, still has some tight bends to keep you on your toes. After about 18 miles the road forks, Route 130 to right, and Mines Road to left, and the Junction cafe sitting in the middle. 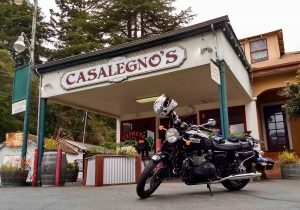 A popular biker destination that serves decent food and with many friendly bikers happy to greet a stranger on two wheels. Once refreshed, continue North on Mines Road, which cuts through quiet creeks and slowly climbs into the local hills. Only a few hairpins, but many wide sweeping bends that go on and on. The road is nigh on deserted, I barely saw a handful of other vehicles over 30 miles. Mines Road comes out in Livermore, well known for it’s vineyards, but we head back West towards Fremont and finish up in the Niles. Here the main drag has a number of decent cafes, including the Florence Bar a little biker joint. This route takes in North of San Fran up in Marin County and Napa. Starting at Golden Gate Bridge, which has got to be done if you’ve never ridden it (plenty of viewpoints on the North side for some selfies). Next stop is Stinson Beach for some ice cream, though traffic can be pretty crap into town on a hot weekend. Continue North where the roads quiet off drastically to Point Reyes Station, a quaint little town with many old style buildings. From here the route gets more interesting as we head up to Petaluma, super smooth, wide roads, with big swooping bends, ideal to crank it up a gear. From Petaluma we cut across to Napa, not the most exciting stretch, but the road does cut through some stunning hill sides filled with vineyards. If you like the grape, this is the place to make a few pitstops and stock up. 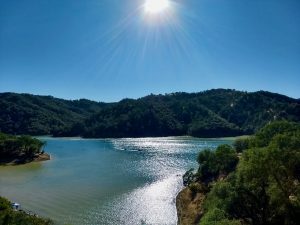 From Napa head out on Route 121 and then 128 out to Lake Berryessa and Winters. A great road on the bike, lots of great twisties to blitz around, guaranteed big grins. If your prefer the grain to the grape, then pop by the Berryessa Brewing Co. in Winters. The final leg retraces our steps back from Winters down Route 128 and a bit of Route 121, before we turn off and head down to Route 80, whereupon we take a quick run South over the Carquinez Bridge (note: electronic toll), then strike a couple of back roads to finish up in Port Costa at the Warehouse Cafe for some tasty lobster and a couple of jars. To download these routes, go to their fullscreen view (top right icon on each map), then from the three dot menu you can find the option to download as a KML file for transfer to your GPS. Do you have any great recommendations of routes or destinations? Please comment below and share what you’ve found.